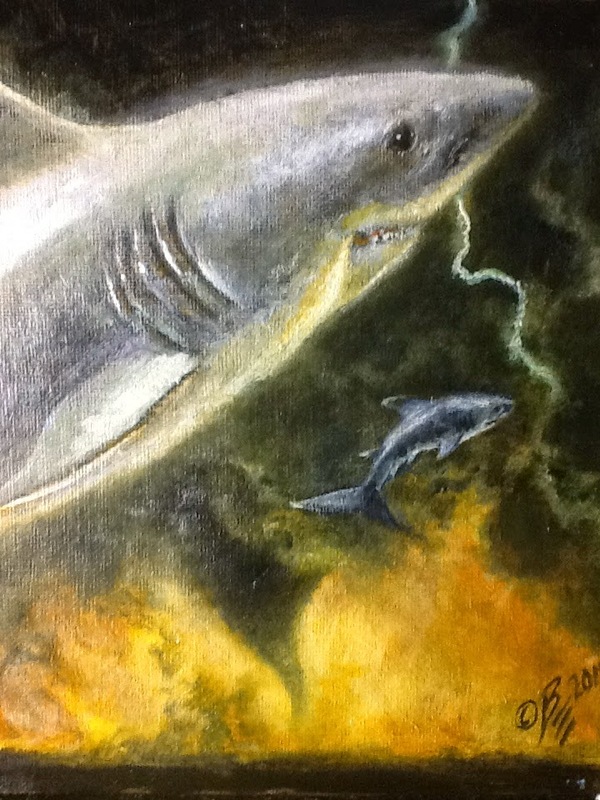 SHARKS JUMPING THE TORNADO (8x10) Oils, $120. Tornado on the Plain. 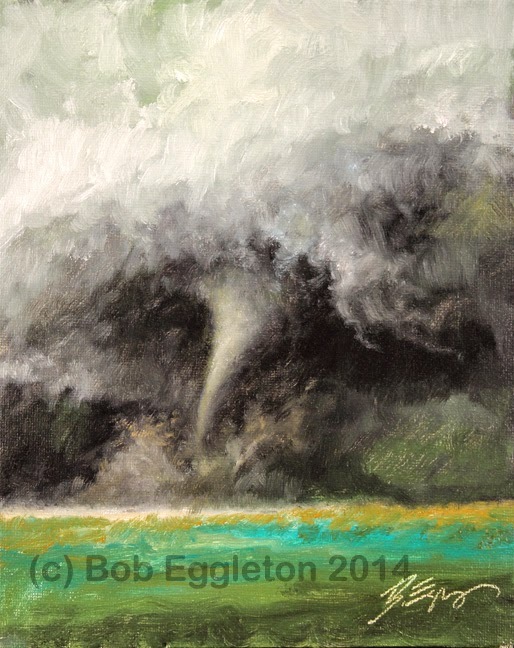 8x10 inches oils on canvas panel, $100. "IT" based on a story by Theodore Sturgeon. 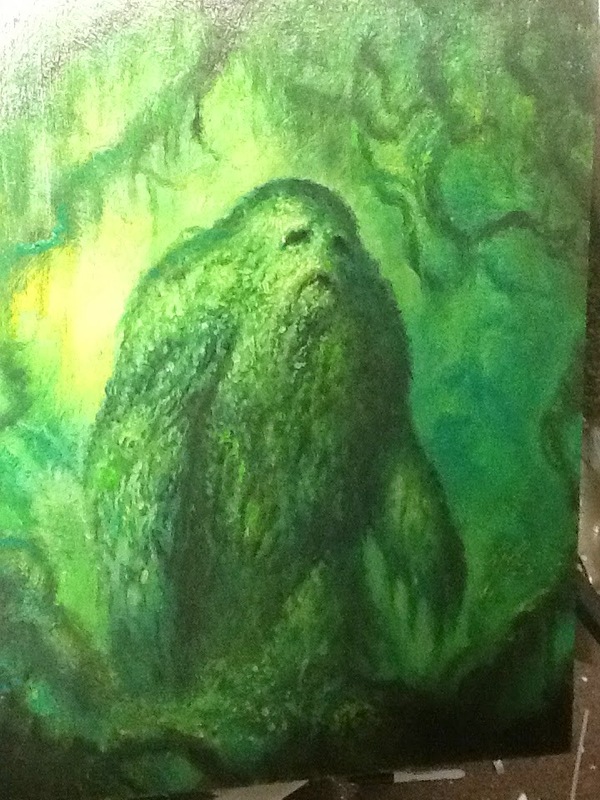 Oils on panel. 9x12 inches $110 SOLD. Been a while since I have added some art, so here is some art!! Me in 1998 with my Hugo. 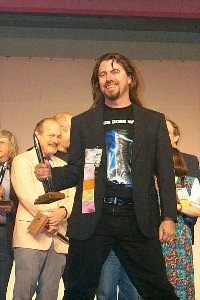 Coming up on 20 years ago, as odd as that seems I won my first of nine Hugo Awards.I won 8 times for Best Professional Artist and once for Best Related Book.I can honestly say I have been moved by winning them over the years, but all artists and writers have their shelf-life with these kinds of things. So I had a string of wins, I'm very proud of that. And with winning them comes the inevitable abuse and backlash. Because this is America and success is often rewarded by attacks from the jealous and hateful, with nasty comments. The Hugo Award is a FAN award for excellence in science fiction and fantasy. It was created in the early 1950s and named for Hugo Gernsback, awarded at The World Science Fiction Convention(created in 1939) and the first one went to Forrest J Ackerman who would later create Famous Monsters Magazine. Over the years it has deservedly gone to some outstanding professionals and fans, In my own Pro Artist category, it went to Kelly Freas, Rick Sternbach, Jim Burns and of course, Michael Whelan all multiple times for their outstanding art to name a few. In those days, fans saw the the covers to magazines and books and voted "snail mail" ballots. Many of my early wins were from this way, until the millenium when the internet took over, I still won, in fact I was the dominant winner from 1994-2004, a good ten year run I won't complain about. And, I was nominated straight from 1988 to 2012. Not bad for half a lifetime of love of a field and realizing that it's okay to be a fan AND a pro of what you practice. The Best Related Book is somewhat bittersweet as the win was "challenged" by a close loser in the same category. He threatened legal action against me and demanded a recount. This was in 2001. This heralded a darker time for this award, when it became highly political. Around 2004 or so, a "new element" began to play a factor in these awards. It crept in from the sidelines, like a virus, from the concept of co-opting the award, not for the love of science fiction but for self-important attention-getting: and like a virus, changing the very cells it infected to make itself an entity. The individuals involved in this "coterie" or star chamber of charlatans who decided from not just a writing point of view but an art point of view to manipulate and change the voting process to suit their own needs. What was inappropriate, was that the individuals were professionals. Professionals wanting to "massage" or gerrymander the voting process, of a *fan* award. Administered by fans, voted on by fans. And co-opted by professionals who were the furthest thing from fans with the agenda of creating awards they could win and bask in the light of. It is one thing to have an agenda which it was. But another to start personal insults with that agenda. One British critic named Adam Roberts, himself a younger man, and with no sense of history, decided that any artist having won the award, since 1966(he was born in 1965) was "unoriginal" and derivative. He personally attacked me, in a blog, not even having known me. 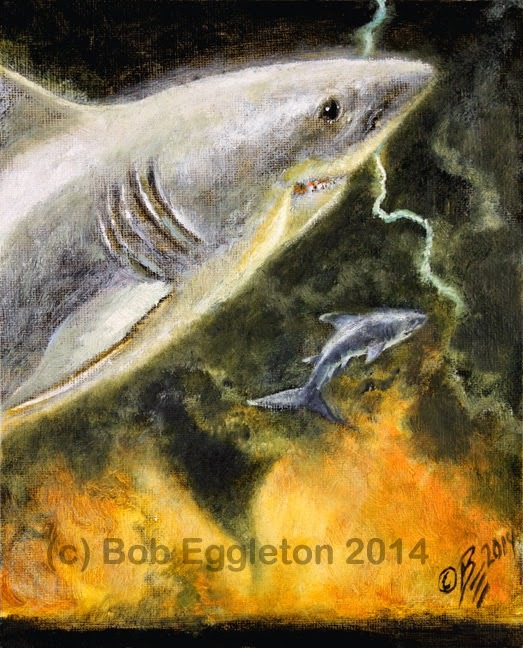 Meanwhile the artist "coterie" attempted a coup of the Professional Artist Hugo by attempting to make it so that myself and other past winners could no longer qualify. The sad part is not one of them had any knowledge of the history of the award. They only saw that they "lost" and not much else which is attention-whoring of the highest order. Insults passed on blogs included referring to me "Just because he's a nice guy and has nice hair does not mean he deserves an award". And that comment came from a VERY surprising source, a person I considered a friend and supported his respected "art annual" book. I realized where I stood with this. I was even publicly "called upon" by another winner, to "bow out" of the award as I was seen as old hat, hurting me deeply in what should have been a good time. This is someone I had only ever shown kindness to. In fact one winner, I had even given him names and tips to get cover art work, in the 90s, which he did very successfully, only later to be kicked in the teeth by his backstabbing. I was simply put, bullied by those seeking the perceived financial reward of such attention from such an award. And believe me, it's JUST perception. As a fan, myself, I warn fellow fans...these people are like, the aliens in INDEPENDENCE DAY(1996) "They jump from world to world, like locusts, taking what they want, and leaving the world dead". Watch them. I warn you, if you are a fan and reading this, their manipulations are a *doomwatch* for the field. They are parasites. Now, we have Hugos that are openly campaigned for. On the net and social media and such, which was inevitable. The recent series of mix-ups and misunderstandings and outright disasters on the part of the Loncon Hugo Awards-controversies created by "professionals" and their agendas, illustrates what has happened to what used to be a fun award ceremony. They complain about a chosen host of said awards, without knowing facts and proceed then to attack his family. Later, when people are nominated(possibly as backlash) "they" don't like and don't want on the ballot, they complain and whine about the choices MADE BY FANS. As to me....I've dropped off the ballot by attrition. Inevitable after 24 years(I was 52 when I fell off so that gives you some idea of time spent on said ballot. Apparently I made the record books for nominations for an artist in three categories). And I am quite happy to have done so, and, quite happy for anyone who wins. My wins can never ever be taken from me. I am gladdened by the fact I am in the history books of Science Fiction for my contributions. I still love SF and Fantasy. It is my blood. My attentions are focused elsewhere and I do well with that. I won in years when it counted. Similar to Michael Whelan, Kelly Freas, Ed Emshwiller, Jim Burns and others...we won when the award was a pretty special thing, basically a THANK YOU from the fans. The Chesleys. 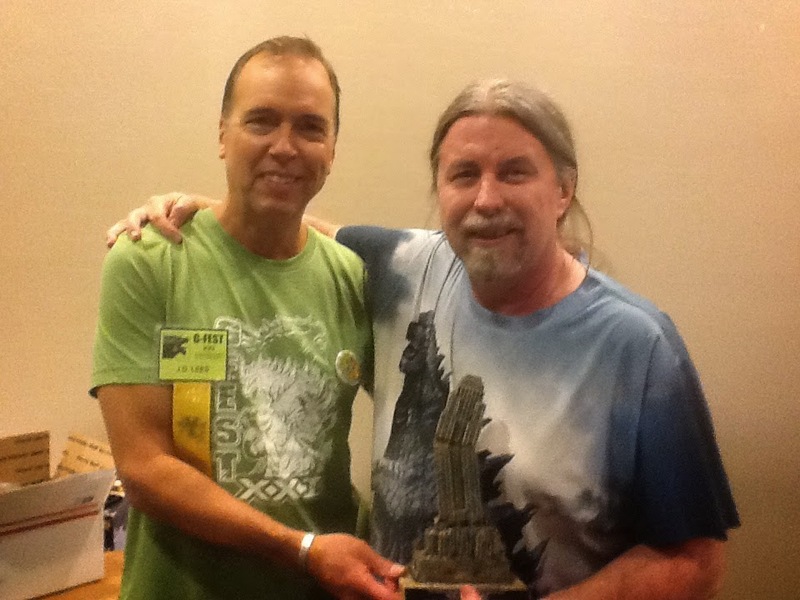 Here is an award sponsored by The Association of SF/Fantasy Artists. The Chesleys, which I have 12 of, from 1988 to 2004, have an air of quiet desperation about them. Knowing the personal anguish of a close friend who is involved in the "suggestions" and "nominations", I can tell you, political doesn't even start to describe it. This is another award that has been quietly co-opted by people who seek ANY award they can get. While I have done award worthy work, I have never won many past 2004. In fact I would say the word "snubbed" simply because I am who I am, outspoken and blunt about these things. I even retracted a piece from a nomination only because via sheer ignorance, no one realized it was a re-used piece from years ago and thus did not qualify. Honestly, I did my thing, it is nice to be "outside" all that. I do not endorse or support ASFA, but, I don't begrudge it either. The Chesleys are simply good for those needing a boost, just starting their careers. I look on from outside the glass menagerie. So here we are at Award Season in SF and Fantasy. I wish anyone nominated the very best. But remember, winning is not everything and when you do win, you will be despised and hated by a vocal minority. Watch them, beware of the collusion of industry professionals, who want to co-opt things for their own gains. I am reminded of President Dwight Eisenhower's farewell speech warning of a "military industrial complex" and look where that led. Watch your backs my fellow winners. The knives are sharpening....enjoy your awards, let NO ONE take that from you. 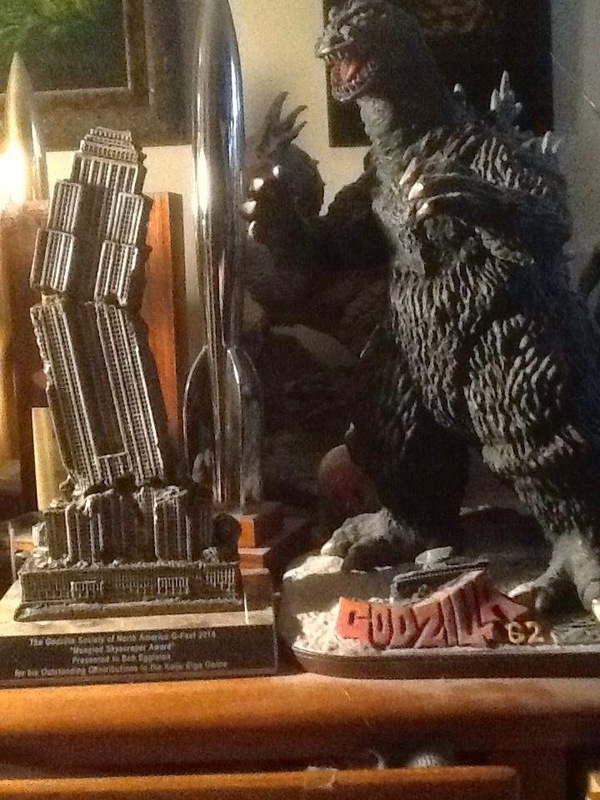 This is a pretty special award I got this past weekend from The Godzilla Society of North America and GFAN Magazine. 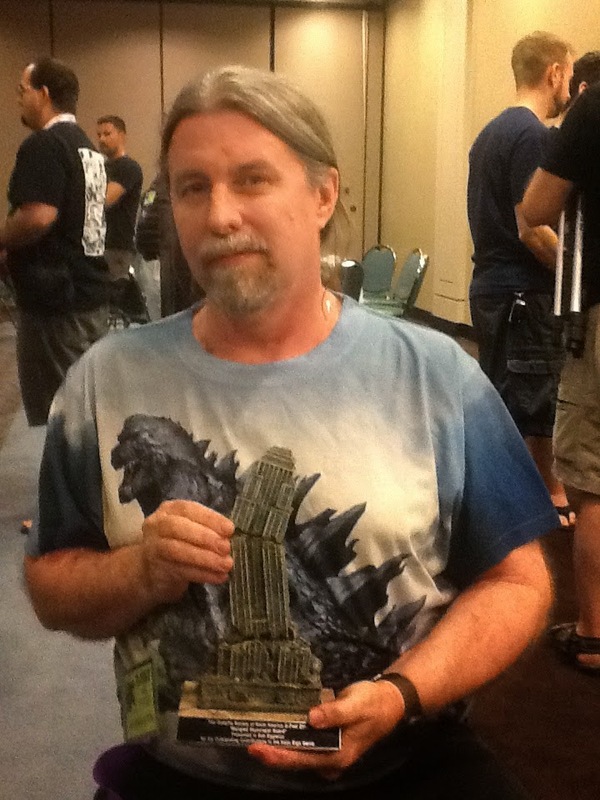 The Mangled Skyscraper Award, designed by SPFX model maker Gene Rizzardi, is given to people having made significant contributions to the Godzilla/Kaiju Eiga genre. Top to bottom, me with the award, with publisher and pal J.D. 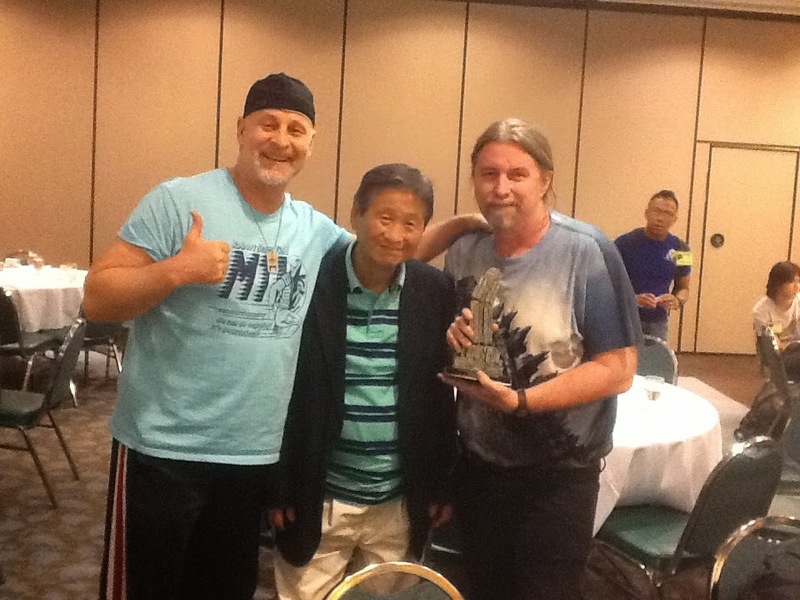 Lees, the award at home next to Godzilla which seems appropriate in the picture and myself with past Toho SPFX director Koichi Kawakita and Robert Scott Field, actor in several movies, ads and TV shows in Japan including GODZILLA VS KING GHIDORAH(1991). This award emotionally moved me like no other I have received because it makes the circle full, Kaiju Eiga is what inspired me in the first place to get into the sci fi biz. I also got a standing ovation at the reception and was also given some wonderful heartfelt words by pals Jeff Horne, John DeSentis and Stan Hyde. I can only say thank you eternally.